This entry was posted in Uncategorized and tagged Australia, Bilbies, Commonwealth, Kate and Wlliam, Life, Miscellaneous., Public figures, Royal baby, Royal Birth, Royal family, Shower Parties by Multifarious meanderings. Bookmark the permalink. Hopefully work will calm down a bit for you now. Have a fun read! I am crying from laughter. This is the best royal baby post I have read. Somebody needs to laugh at them, pretentious bunch of ninnies! And if Baby Prince Wind had waited one more day he would have shared my birthday. He could never have dealt with the competition! I wish they’d get a taste of a normal life, and I do fel sorry for Kate because I suspect that she wouldn’t have chosen “George” as a name for her baby if she’d married anyone else…. Baby Prince Wind is miles better than the name he got, poor little bugger. Happy belated birthday!!! Oh, and sorry, Happy Belated Birthday LLS. Thanks! Hope she reads it! Ha ha, great thinking! There is definitely a strong resemblance. I’m really glad to hear the Aussies are spending their money on something that will benefit them, that’s bonza mate! It’d definitely a good idea to put the money into saving endangered species rather than on gifts that won’t be used. Having said that, they should be funding research without using it as a way to curry favour with the UK (oops, that sounded very colonial, what, what old boy, but you get what I mean). Happy Bday to the lil sis! Love the side by side pics of the ears. Well done! 😀 Maybe the Australians should have offered baby George a VW instead…..
Oh, no, no, we wouldn’t poke fun at HRH. 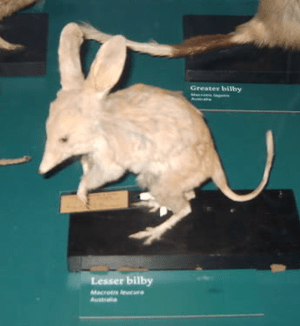 The bilby in the picture looks very insipid. It’s actually a mainstay of Australian life since it delivers our Easter eggs – rabbits being English vermin. Happy belated birthday to LLS. 🙂 And we have a response from a real Ozzie!!! I would look insipid if I was stuffed, too. They don’t look big enough to carry Easter eggs; is the risk of having no easter egg delivery the reason for trying to save it? interestingly enough, there is a big-ear leitmotif for Easter-egg delivery… Apparently they get attacked and eaten by cats, who don’t seem to have the remotest romantic bone in their bodies and have no problems with eating the Easter egg delivery-boy. Fifth attempt to comment. Third browser. 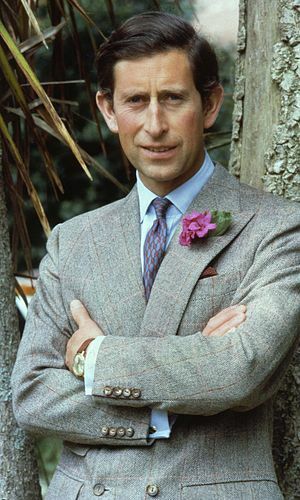 Love this post – wish your lls a belated happy one, and I will try not to think of a bilby every time I see a pic of Prince Charles – or the other way around! I love how their gift to the baby is essentially a gift to themselves – those damn aussies!! Now the tower would be great fun. Fit a walk-in shower and rent it out! sounds like a great renovation project for me! The Royal baby obviously has to keep the side up, with so many important people born on the same day as him. I will be keeping an eye on the evolution of the kid’s ears….